This August, we're featuring 6 inspirational women who are making a name for themselves in the food industry. How did your love for baking / cooking develop? I have had a lifelong obsession with food and my friend Nadine’s love of food began when I begged her to join me on a culinary adventure with Jan Hendrik Van Westerhuizen in France last year where we were lucky enough to dine at his restaurant and go on a “foodie” tour with him. 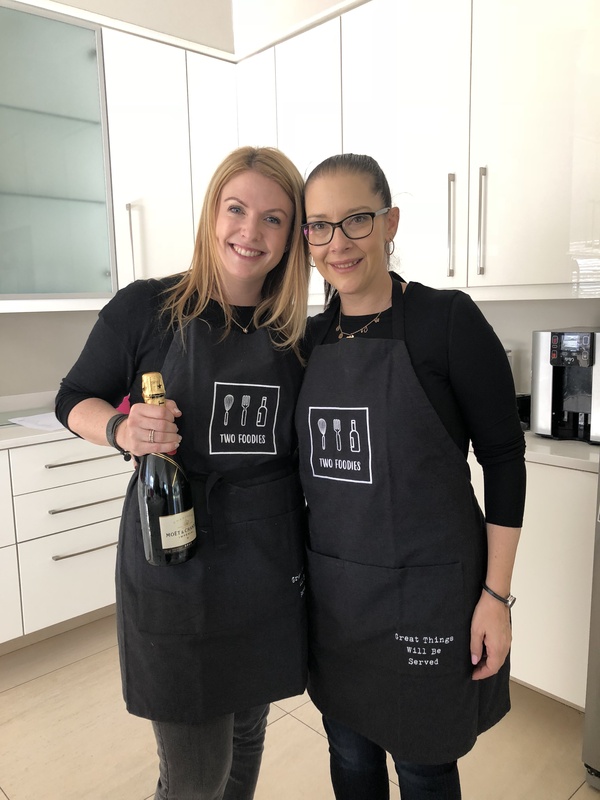 This experience led us to starting Two Foodies which aims to elevate home cooks to restaurant level through exposure, learning and masterclasses with some of South Africa’s best professional chefs. I have always loved to travel. After studying a BComm Marketing Honours I decided it was time to travel the world before settling down into a real job. I lived in London for two years where I saved all my money to backpack around Europe and Asia. I fell in love with Thailand and landed up working in a Thai restaurant on Phi Phi Island. Living, eating and working there taught me to love anything and everything with Asian flavours. Candice and I hope to get other food lovers and home cooks to enjoy all of our favourite dishes which have been created by ourselves as well as other guest chefs. Enabling passionate foodies to learn the skills in our kitchen, preparing, cooking and plating food that looks as sophisticated as gourmet restaurant dishes. What sort of food do you serve and what are your favourite ingredients to use? Candice: "We want to give the everyday home chef or obsessive foodie the opportunity to learn new skills, discover new techniques and ingredients and practise new recipes. Our food is about making each ingredient shine, so that it can be used again in a variety of dishes. For example, one of our chefs made a rack of lamb dish with an Asian glaze that can be used in a variety of ways as well as on many different proteins and is just delicious! And the cauliflower puree is also very versatile and can be paired with many different dishes as can the baby carrots." Nadine: "My favourite ingredients seem to be fresh and fruity and always compliment an Asian meal. I love using coconut milk, whether it is in a smoothie, Thai curry, a creamy butternut soup or even an ice-cream. " My top 5 kitchen tools, hmmm that’s a tough one, there are so many! 1) But I think having a good set of kitchen knives such as Zwilling or Wusthof is essential and I absolutely love the small serrated pairing knives from Victorinox, I have them in every colour! 2) A really good cast iron pot and roasting dish by Staub really make a difference to even temperatures when cooking. 3) Wizbake oven liners I use everyday in my house on the roasting trays, they are brilliant. 4) Any kitchen utensil by ZEAL, they are the best silicone spatulas, spoons, tongs I’ve ever used. 5) Lastly my Alessi Anna Corkscrew to open my mandatory bottle of wine when I cook! 1) One of the most useful things to have in a kitchen is a good wok. Cooking stir fries, fresh veggies or even a pad Thai is quick and easy. 2) I use the OXO Mandoline Slicer almost everyday. It really speeds up my prep especially for salads. 3) The Nutribullet is also a favourite in my kitchen. From whipping up a quick smoothie for breakfast, to chopping nuts or even making a really smooth puree. 4) I also like to have lots of chopping boards. Cooking a complicated dish always involves many boards for different elements of the dish. I use any of the Joseph Joseph ones. 5) A good butchers block is also essential. I think the food industry today is so exciting and diverse and there are so many different types of food experiences to be had. There’s no doubt that it’s a great and growing industry as more and more of us are so interested in all things food.